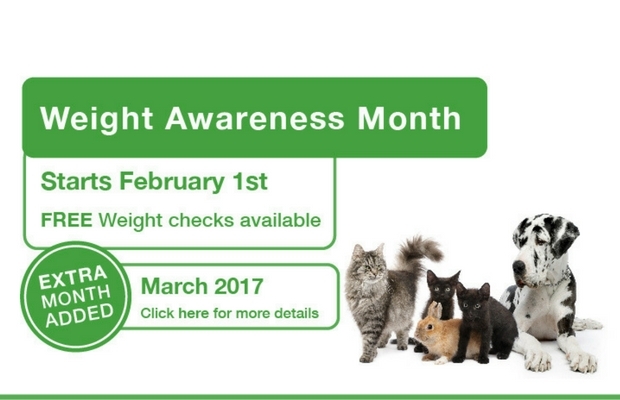 Even if you don’t think your pet is over or under weight, we would recommend you take advantage of our FREE weight awareness month, which has now been extended to include March 2017, and come in to see Mhairi, one of our dedicated veterinary nurses to have your pet weighed and discuss not only pet’s weight and body score, but all aspects of your pets diet, exercise and general health and wellbeing. Weight awareness is for all pets and appointments will be available between 9.30am – 5pm Monday to Friday. Please contact our Reception team on 01738 621415 to arrange a FREE appointment. Additional Information – For dog owners, this would also be an opportunity to speak about our hydrotherapy pool and the benefits it could have for your dog. This entry was posted in Cats, Dogs, Pets and tagged Cats, Dogs, Pets. Tay Valley Vets Festive Facebook Giveaway!